Zucchini is one of my favorite veggies. I love it for its fresh taste and for its health benefits too. It's a gift from the garden and I love to incorporate it into my diet. 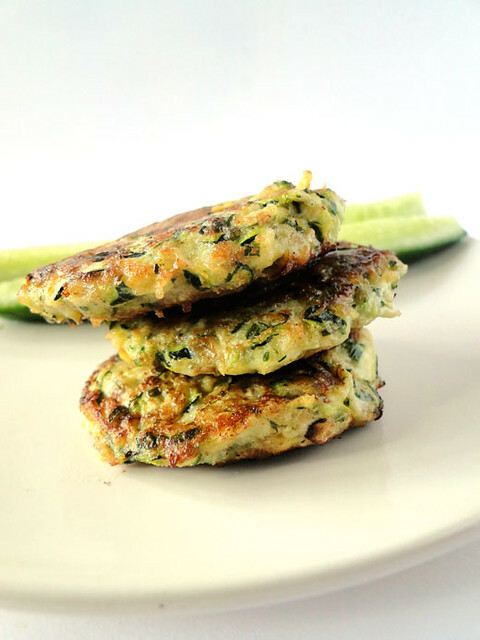 Here, zucchini mixed with onion and cheese is transformed into some heavenly fritters. I really like the combo of zucchini, summer herbs and cheese. The key is to get as much water out of the zucchinis as possible so they fry up with a good crisp crust. 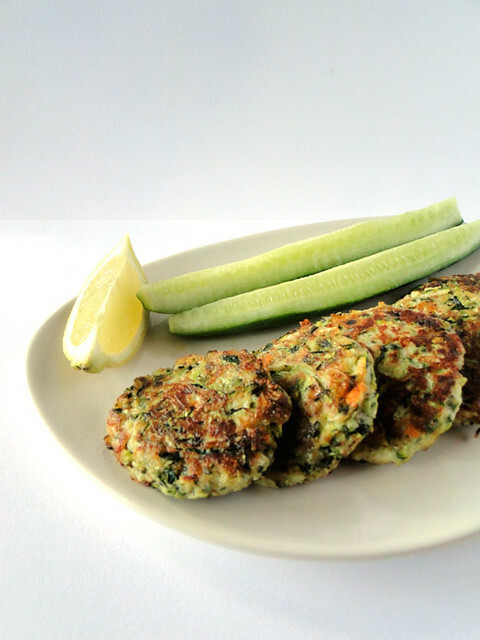 Zucchini fritters are incredibly easy to make and great to eat with fresh sliced cucumbers, some lemon wedges or tzaziki. In this recipe, I used kashkaval cheese, but you can substitute it with feta cheese or even Parmesan. Grate the zucchini coarsely and put into a colander. Sprinkle lightly with salt and toss, then leave for 20 minutes to drain. Rinse the zucchini briefly, then squeeze it to extract as much liquid as you can and pat dry with kitchen paper. Form zucchini patties with your hands. Heat some oil in a large skillet, and brown them on both sides. Râpez grossièrement les courgettes sans les éplucher. Faites-les dégorger 20 mn environ dans une passoire après les avoir légèrement poudrées de sel. Pressez-les bien avec les mains pour qu'elles rendent toute leur eau. Formez des boulettes avec vos mains. Faites chauffer de l'huile dans une poêle, et faites les dorer sur les deux côtés. That is a speciality I adore! Your fritters look delicious! I too love Zucchini Friters. Do you have a potato ricer? I pop grated zucchini into mine and give it a squeeze. An incredible amount of water comes out, this is best the method I've come across and I don't need to salt and let the zucchini stand a while first. It great for grated raw potato for rosti and for squeezing the excess water out of cooked spinach too. My potato ricer hardly ever gets used on cooked potaotes these days! Chico, yours look delicious...a fave for me too in the summer! How delicious they look! I haven't made these in a long time--suddenly feeling inspired! very nice! I have lots of zucchinis growing in my kitchen garden.... will try this one next time thanks! I have never made these so Thanks for the recipe. i always love eating fritters, but I never make them at home. i should try these. These fritters look beautiful and so delicious! I keep seeing zucchini fritters and they look so good! I'm going to have to break down and try them. Your recipe looks delicious and not too hard. Thanks! Your zucchini fritters look delish, especially with the addition of cheese. Anything fried that has cheese gets my vote! My wife's parents are innundated with zucchiini right now, this is a great idea to stave off those giant green monsters. I love zucchini fritters! I've made them with goat cheese too - a little bit stuffed into the middle of each one is delicious. 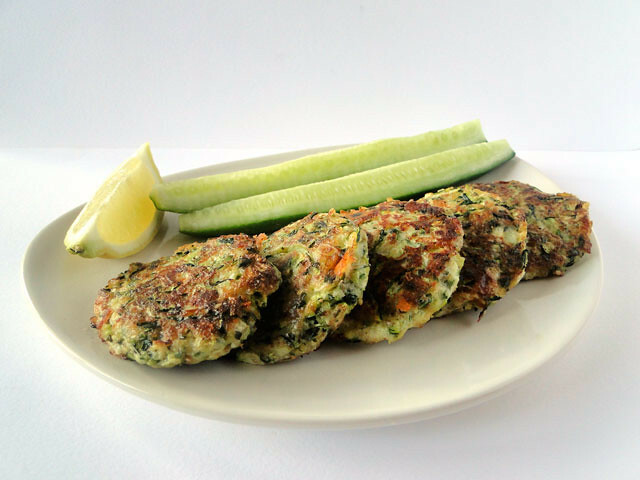 I made zucchini fritters this summer too, I just love them and your photos are beautiful! These must be so tasty....yumm! of all the zukes I have been cooking I have never made fritters with them. perfect snack. These look adorable! I love them at breakfast or as a snack. These fritters are the same as what we make in Turkey. Another recipe we share in our cuisines. oh, this looks and sounds super tasty! These look so good! I also love zucchini, but we don't seem to cook it nearly enough. Your photos are great! This is a perfect light lunch dish. Looks so good and yummy. Your fritters look great! I haven't made any yet this year, but I'm looking forward to it! Your fritters look delicious! I'm new here and so glad I found your blog! Thanks for the great recipe that I will try! This is the ultimate recipe with all those zucchinis floating around the markets right now. It could be the ultimate fate of the zucchini I bought at the market. Thanks for the idea. These look absolutely amazing! I cannot wait to make them! These looks so good and using the feta is a treat! Beautifully presented. I have an absolute weakness for fritters. And zucchini fritters? DELICIOUS! Yummy.... it's so good ! Cela ressemble a une spécialité marocaine : maaqouda... un délice !